Hi, I'm Natalie - just an average woman from a small town in the Western Cape of South Africa, called Knysna. Knysna is not only a paradise for its locals, it's appreciated by many South Africans during holidays and thousands of international tourists visiting the garden route. On the 7th of June 2017 Knysna was ravaged by fires and this idyllic town was burnt to the ground. Families have lost their homes, livilhoods and are left hopeless, helpless and homeless. I'm a fifth generation "Knysnarian" and it is therefore my duty to stand up for this town I've called home for 34 years, to help rebuild a town that has lost schools most of our parents and even some of our grandparents went to, lost churches that unite communities, lost businesses that have survived economic hardships, lost homes that have housed generations, hosted children's birthdays, accommodated visiting families and sleepovers. If walls could talk surely there would be no more entertaining stories than those of the walls of the building of Knysna which are now lost. All I ask is for a little help for the people I've shared most of my life with because they are all a hardworking, accepting, welcoming community and are now more deserving than most. Give what you can, if you can so we can rebuild this little piece of paradise. All funds donated to this campaign will be used for the people of Knysna, specifically for relief of this disaster (via the local NSRI and Rotary) as well as the local animal welfare (KAWS). GREAT NEWS! The donations are going to be transferred via SABLE FOREX today and should be received in a few working days by the recipients. PLEASE DO NOT DONATE TO THE CAMPAIGN ANY LONGER. I just wanted to let everyone know that I am in the process of withdrawing the donations and moving them to a forex acc, as this is my first time fundraising I wasn't aware of the delays there would be as I hadn't set up a beneficiary straight off the bat, with GO FUND ME. This means until the beneficiary acc has been verified anyone still wanting to make donations may do so. I would like to thank everyone who shared & donated to this campaign as well as any other effort to help those in need, every amount will make a difference and that's something we should all be proud of. I would like to thank SABLE FOREX, namely REG BAMFORD who has generously offered to waive the fees of transferring the funds from UK to SA, Carey Kolver who promptly assisted me in opening an acc with Sable Forex and Gemma Cloete for talking me through the process. I'd like to thank Hayley Reichert, Sean Smeardon and Leigh Elliot who were supportive and offered help and advice in my blonde daze and confusion. Please all be patient, I'll update you when the donations are leaving SABLE FOREX. Let's all remember to pay it forward. I just want to let all of you know I will be closing this campaign and transferring the donations on Friday, 16th June 2017. I will update everybody on the day. Thank you all for your generous donations and well wishes, I hope the one thing we all take away from this is the importance of paying it forward! I'm getting a lot of enquiries as to what the funds will be used for and how they will get to the relevant accounts in South Africa. Firstly the funds are going to the local Rotary, NSRI and KAWS. Secondly if I have to physically withdraw every penny from my local Lloyds Bank, get a train to London to catch a flight from Heathrow, change at Frankfurt, arrive in Cape Town, catch a national flight and get my sister to collect me from George airport to drive me to Knysna to ensure the donations are received by these three organisations then that is what I am prepared to do! Hey Natalie, where will the funds be going? I'm so proud of SA for standing together in a time of crises, hurt and pain,but then I heard from family that went through to Knysna to see if they could help that lots, if not most of the donations given ARE NOT going to the people that lost everything. Apparently theres not much control of who gets what and stuff are just been handed out to whoever falls in the queue. She said as they first drove into Knysna, the informal settlements on the side of the road was not affected by the fires at all.they drove through the settlement and saw one house which roof was blown down but otherwise no other damage. Drove through to Knysna heights, Belvedere, the area next to the river, Brenton on sea etc. The damage and loss in these areas where heartbreaking. Now what hurt me the most, was to hear that they saw hundreds from these informal settlements standing in the queue, taking water and food parcels, clothing etc, that was meant for the victims of the fires and the firemen. Please note, they haven't lost their homes, food or clothing but they're the ones receiving donations instead of the real victims. Where is the control! This us so sad that in times like this, they still steal from those that are in desperate need. How can we donate in Rands from here in Knysna? We are one of the fortunate ones that are safe and would like to make a donation. Still no word on where the money is going? How will these funds get to South Africa as SA is not on the list of supported countries and therefore cannot be deposited into a local bank. 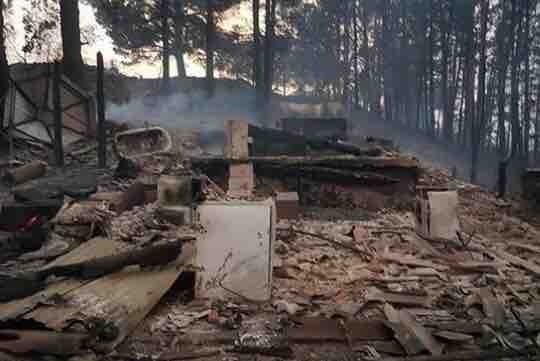 Here's also another Gofundme for Knysna: Knysna Fire. Where to donate? Do you have bank details? Hi Natalie, When will you be sending the funds to them, as they seem to have the fires under control now. With major disruptions to local services, power etc. They are in desperate need of food, clothing, shelter etc. Thank you to my very generous friends Andi Ancheta and Lisa Hanthorn. Please accept my donation for all those whose lives have been devastated by the fire. Sent with love to a wonderful place I had the privilege to live in for 6 years.